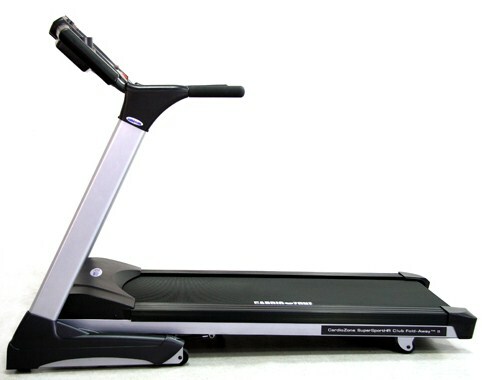 CardioZone SuperSport HR Club II is a extermly powerful commercial treadmill and is run a 4.0 HP continious motor, having a maximum speed limit of 12 mph. Motor Extremely powerful commercial quality WhisperQuiet™ 4.0 HP maximum capacity/3chp holds up to a 500 lb. person – Lifetime motor warranty! Largest Motor/Lowest Price in its Class!! Maximum user weight capacity “Ultra” heavy duty 500 lbs. walking / 450 lbs. running maximum capacity with upgraded Lifetime Frame/Motor Warranty! Beefy 6″ Massive Solid steel uni-welded construction has 500 lb. user weight capacity, the sturdiest and heaviest on the market provides “Rock-solid” Health Club Quality workouts to last a Lifetime! Deck One-of-a-Kind TripleFlex™ Bio Reflex Deck System™ Technology utilizes the same space age composite used in Formula 1 race cars provides three levels of shock absorption. Front of deck has maximum suspension to reduce impact when landing, center of deck offers moderate suspension and rear of deck is firm for pushing off. Electronics Extra large Commercial LED display and dot matrix, feedback includes: speed, distance, fat calories burned, time, elevation, and pulse. Programs 14 Programs – 4 custom / 3 preset / Golf, Basketball, Tennis Trainer / 1 Body Fat % Analyzer/ 4 user defined / 1 Manual / 1 heart rate interactive. Unique Body Fat Percentage Analyzer calculates your fat loss and muscle gain for maximum motivation! Insta-Touch™ Direct Speed & Incline Selectors Yes! Access pre-set speed and incline levels with the touch of a button! Frame Type Non-Folding. This amazing commercial treadmill weighs nearly more than double the weight of most lightweight, flimsy treadmills! Built in Reading Rack Yes! Built in Water Bottle Holder Yes! Includes FREE Water Bottle! Warranty Free Upgraded Lifetime warranty (residential and commercial use) on the frame, drive and elevation motors, drive belt and the running deck, these are all of the most expensive components. $500 value. 2 Years on all other Parts and 1 Year In-Home Labor/Service warranty for non-commercial use. *Note: Most of the sites, stores or shopping portals listed above sell CardioZone Commercial SuperSport HR Club II (non folding) with discounts and other exciting offers. There is a possibility that the some of above websites are not selling CardioZone Commercial SuperSport HR Club II (non folding) now. Toughtrain.com is not liable for such cases or instances. Also we do not recommend any seller for CardioZone Commercial SuperSport HR Club II (non folding) and a buyer should buy from where he/she gets best deal with quality of products, service and on time delivery (shipment). Good Morning: The wheels on my treadmill have broken and need to be replaced. Is that something you could assist with? Thank You!